(Phys.org) —Currently, precision laser ranging is limited to the Earth-Moon distance. These systems are based on passive laser ranging, so that the signal deteriorates as 1/R4 over distance R. In a new study, physicists have designed a system that has a range thousands of times this distance due to the fact that it is based on active laser ranging, where the signal deteriorates as only 1/R2. The new system also has the potential to achieve sub-millimeter accuracy, yielding an overall performance improvement that is more than three orders of magnitude better than today's state-of-the-art space ranging systems. The scientists, Yijiang Chen, Kevin M. Birnbaum, and Hamid Hemmati at the California Institute of Technology's Jet Propulsion Laboratory in Pasadena, California, have published their paper on the long-range, high-precision laser system in a recent issue of Applied Physics Letters. "In principle, this approach could be scaled up to any interplanetary distance by increasing the size of the telescopes," Birnbaum told Phys.org. "We calculated that ranging from Earth to Mars or Jupiter should be achievable with quite modest telescopes of 1 m in diameter on Earth and 15 cm on the spacecraft." In the new laser ranging scheme, there is one transceiver at each end of the distance to be measured. Each transceiver transmits and receives laser pulses. The pulses are time tagged when transmitted and when received, and the time it takes the pulses to travel between transceivers is used to measure the distance between the transceivers. As the scientists explain, having these "active transceivers" is key to the long-distance range. "Radio frequency (RF) techniques are limited by uncertainties in the intervening medium that can slow down the radio wave by a variable amount," Birnbaum said. "The effects of the medium—that the gap between the spacecraft and the ground terminal is not a completely empty vacuum—are smaller at optical frequencies. "Compared to current optical technologies, the key is that we use an active transceiver. Currently, optical ranging is done by bouncing light off of a passive target, a reflector. This is very effective for ranges up to the Earth-Moon distance, but it is simply not reasonable for interplanetary distances because the planets are thousands of times farther than the Moon. The amount of light falls as 1/R4, so the signal would get trillions of times weaker if you tried to use the same passive system to measure the range of the planets. We use active transceivers with lasers at both ends, so each end can see a much brighter signal." Birnbaum explained that the laser itself is not any more powerful than those in use today. "The lasers themselves do not need to be very powerful," he said. "Commercially available lasers have enough pulse energy, and the light intensity as it leaves the transmitter can be low enough that it is even eye-safe. The key is to have a very sensitive receiver and a method to pick out the 'signal' photons from all the background light." The scientists tested the approach with lab experiments and field testing on Earth. They measured deviations in actual distance of no more than 0.14 mm, well below the goal of 1 mm precision. Although fluctuations due to atmospheric turbulence in Earth's atmosphere will add a small amount of error, the scientists think that this error can be limited to less than 1 mm. The biggest challenges to realizing the long-range, high-precision laser include synchronizing the transceivers and overcoming a background of stray light. 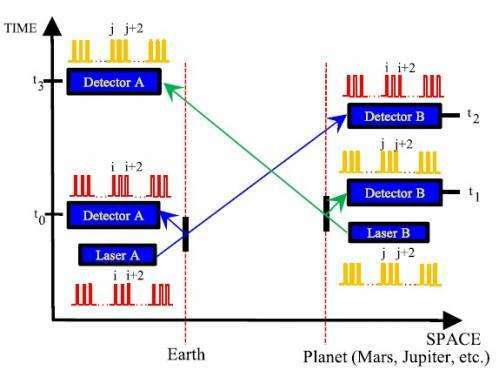 The researchers plan to overcome these challenges by using a new synchronization scheme involving interplanetary laser communications, along with using short pulses with a low repetition rate. In the future, they'd like to test the system on a somewhat larger scale. "Having demonstrated this technique in the lab and between two terminals in the field, we'd like to next perform ranging between a transceiver mounted on an airplane and one on the ground," Birnbaum said. "Then we could move on to ranging between a ground terminal and a spacecraft." This giant leap in laser ranging could have many applications. One of the first may be to solve the puzzle of the composition of Mars' interior. Since the 1970s, scientists have been trying to find out if the interior is liquid or solid, but their attempts have been thwarted due to limitations of RF ranging precision. If the new laser ranging approach were applied to a future mission to Mars, particularly Mars Landers, it has the potential to resolve this open question. Interplanetary precision laser ranging could also enable new tests of fundamental physics, including tests of the equivalence principle, the apparent acceleration of the expanding universe, and the possible existence of extra dimensions. The laser system could also enable tests of gravity, which could lead to the discovery of a violation or extension of general relativity, or the presence of an additional long-range interaction. Finally, the laser system could enable various tests to be performed on the planets and other solar system bodies, which could shed light on their evolution, atmospheres, oceans, and ring material. These measurements are currently based on RF ranging techniques, which have limited precision. This could be part of a Mars "geophysics" mission that would perhaps include seismic sensors etc. Hmm..real time communication with astronauts or unmanned spacecraft. Why would you think this would be any faster than radio? "In principle, this approach could be scaled up to any interplanetary distance by increasing the size of the telescopes,"
-I wonder if this could be scaled up for beam propulsion? -It would make sail area smaller and work perhaps over interstellar distances. The concept is somewhat obvious to those in communications. As stated, synchronization is the challenge, especially as the planets are constantly moving with changing travel times. Very impressive upgrade in accuracy. might take a look at the success from quantum entanglement. *IF* there are advanced civilisations out there, they would be far more likely to be using lasers as a form of communication. SETI needs to get away from the radio searching fixation. This is not about communication. It's not about propulsion either. You don't have to read past the first sentence to see it's about measuring distance. Digressing further to communication vs measurement, private SETI efforts like Harvard MA OSETI have been looking for optical signals for well over a decade. So what makes you think this tech wouldn't be applicable in those areas alfie?